If you’re already a Bitdefender customer, you might be thinking about getting their VPN. But is it worth the price tag? Bitdefender isn’t just a VPN, it’s a comprehensive security suite known as Bitdefender Total Security, which releases a new version each year. We are always skeptical when these companies include a VPN as part of their security software package (alongside an anti-virus and firewall, for example) because it typically isn’t as good as a dedicated VPN from a different provider. Is Bitdefender’s VPN any different, though? It apparently piggybacks off Hotspot Shield‘s technology and so we expect it to be pretty much identical. More on this later. This means that a solution is never too far away. 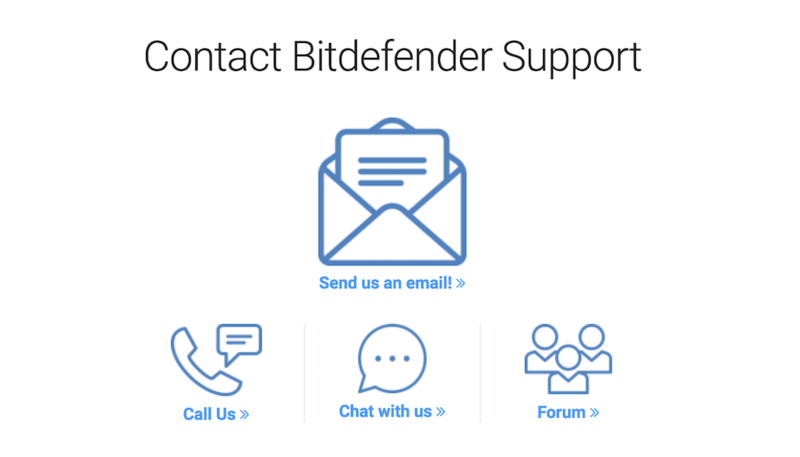 Bitdefender has an extensive knowledge base that covers common questions asked about their products, as well as how-to videos. We recommend searching the forum and knowledgebase first before reaching out to customer support—it is likely your query has already been asked and answered. Buying Bitdefender VPN can mean you end up with more value than purchasing Hotspot Shield by itself, plus you get the entire Bitdefender security suite on top. Bitdefender’s 2019 Total Security Suite includes the basic VPN and costs just under $85 for one year. 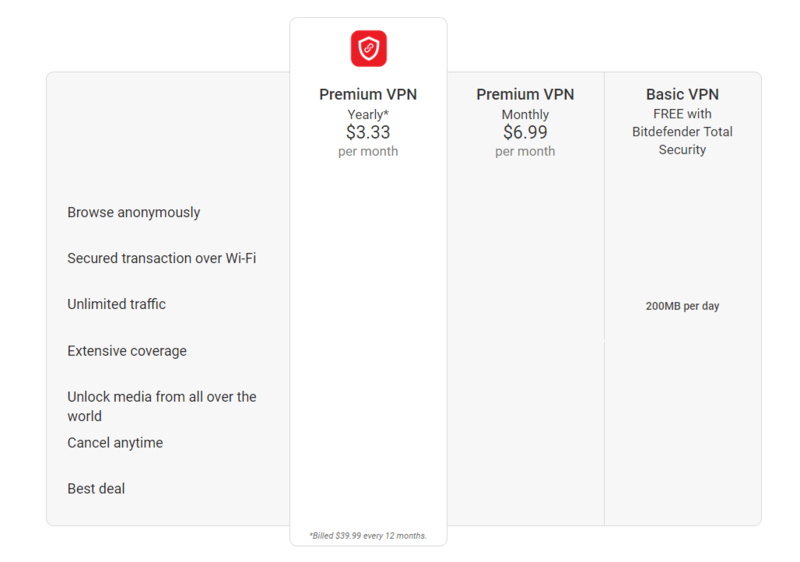 While you can’t pay for the Total Security Suite on a monthly plan, you can purchase a one year’s subscription to Total Security 2019 and pay an extra $6.99 per month for the Premium VPN, or $3.33 per month if you get a yearly plan. For comparison, buying HotSpot Shield for 3 years will get you to $3.49 per month. We recommend the second option if you’re going to buy Bitdefender, since the basic VPN doesn’t do much. Actually, we do have a third option… read our conclusion. Note of Warning: You can’t use Bitdefender’s Premium VPN as a separate product unless you already have a Bitdefender security solution installed. If you’re not happy with Bitdefender’s VPN (or indeed their Total Security suite) you can get a full refund with no questions asked. Bitdefender has a 30-day money-back guarantee. All you need to do is email and ask for it. Note: The 30 days starts ticking from the moment of purchase, not from when the product is installed. Bitdefender Premium VPN is simple enough to use. It looks a lot like Hotspot Shield did before their re-design and has a user-friendly main screen. You can either hit ‘Connect‘ and let Bitdefender choose the most optimum server or select your own from the drop-down list. We can’t complain, though—just like Total Security 2019, the VPN is designed to be as user-friendly as possible and, as a result, is a simple product. Bitdefender Premium VPN supports the following protocols: L2TP/IPsec, IKEv2, and OpenVPN. In an ideal world, Bitdefender would be using AES 256-bit encryption but we can neither confirm nor deny this. Bitdefender’s VPN is available on Windows, Mac, iOS, and Android. But you’ll need to select the correct Bitdefender product to go with your device of choice. These options all include the basic VPN limited to 200MB. For Mac and Android, there’s an option to purchase a subscription for the Premium VPN. For iOS, there’s currently no option to do that. 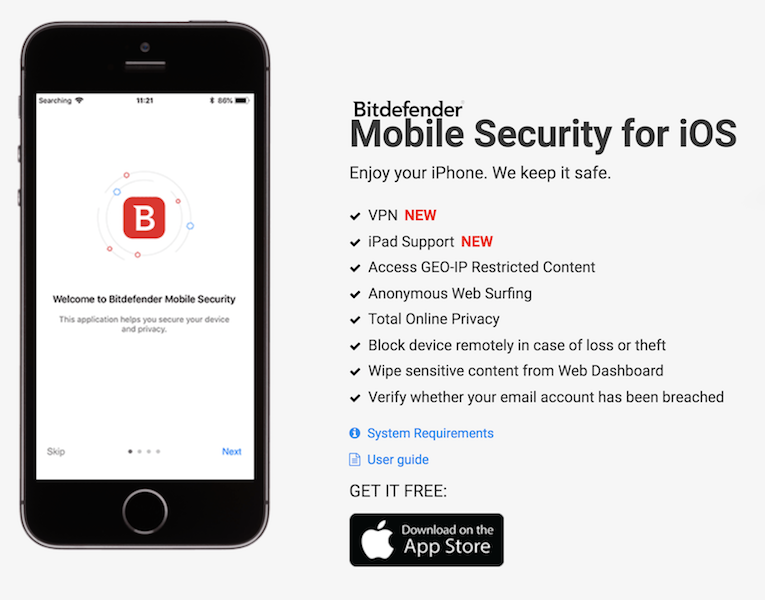 This means if you’re looking for the best VPN for iOS, Bitdefender is not your friend. If you buy a Total Security License covering 5 or 10 devices, you can use it on up to 5 or 10 devices that Bitdefender supports. The idea of a complete security suite sounds great but you can certainly tell that the developers’ focus was not on the VPN element of the product. Buying the security suite alone doesn’t give you full access to their VPN (a bit cheeky if you ask us!) and so you’ll be restricted to 200MB of data per day and the inability to pick your own location and server. 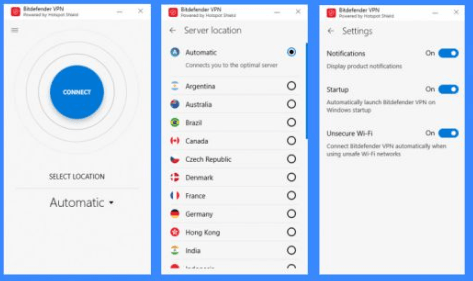 If you want to choose which server to connect to, you’ll need to fork out for a Bitdefender Premium VPN license. Doing so gives you access to the same number of servers and locations as Hotspot Shield–2,000 across 25 locations. VPN Speed and Performance: 75% slower, ouch! OK, so the number of servers on offer may not rival the likes of ExpressVPN or NordVPN, but it’s about quality over quantity, right? Now, this might not look so bad, until you learn that our regular download speeds are 200Mbps when not connected to a VPN. So these results represent a ~75% reduction. We weren’t surprised to learn that Bitdefender doesn’t work with Netflix. We tried out several key servers (e.g. those in the U.S.) to see if it could join the list of VPNs that can unblock Netflix, but none of them worked. We got the typical Netflix proxy error. As a ‘family-friendly’ cybersecurity company that primarily creates anti-virus solutions, Bitdefender does not support torrenting or P2P activity over their VPN service. Though Bitdefender VPN piggybacks on Hotspot Shield’s engine, it turns out there are some differences between the two services and their stance on torrenting is one of these. Suffice it to say, Bitdefender is not the best VPN for torrenting. Bitdefender accepts major payment methods such as credit or debit cards, PayPal and bank transfer only. It’s not very privacy-friendly as it offers no cryptocurrency options or gift cards. Since Bitdefender Premium VPN uses Hotspot Shield’s network and servers, we need to look at both companies’ privacy policies. That doesn’t tell us much aside from the fact that Bitdefender can see which devices you’ve installed the VPN on. And while they claim this isn’t disclosed to any third parties, we never like to see VPN services openly admitting to logging anything. An anti-logging policy is the best policy. Unfortunately, Bitdefender Premium VPN doesn’t include a kill switch. This is exactly what we meant when we said that non-dedicated VPN companies usually don’t offer a full product. The absence of a kill switch means that there is nothing to kill (hence the name!) your internet connection should your connection to the VPN drop. In this scenario, this would leave your IP address and data in view of the very people you are trying to hide it from. Bitdefender is a Romanian anti-virus and cybersecurity company that was founded in 2001 and is currently headquartered in Bucharest, Romania. It is estimated that there are over 500 million people who use Bitdefender’s products worldwide and this makes them a serious player in the cybersecurity market. In fact, the company ranks fifth in the global market share for Windows anti-malware and anti-virus software. We do not know the reason why Bitdefender decided to use Hotspot Shield’s underlying services – but we do know that white labeling services is a common practice and we’re sure it’s bringing some decent revenue for Hotspot Shield. Bitdefender, LLC is registered in Romania which is outside the 14 Eyes group of countries who agree to share intelligence. Hotspot Shield, on the other hand, is in California, which does fall under the alliances. This is a very simple VPN product, as can be expected for any non-standalone services. Who is this VPN for? Your guess is as good as ours. Probably for those who want to feel safe but aren’t actually safe? If you want to use Bitdefender products and want to simply waste money, go ahead with the basic or premium VPN. Otherwise, we would recommend that you go ahead and purchase a dedicated VPN service such as NordVPN and ExpressVPN that can do everything Bitdefender can and so much more. There’s no doubt that Bitdefender’s Total Security suite can be a fantastic product, but its VPN is not. It’s fine for basic users who want a secure VPN while out and about for general browsing, but we can’t recommend it for more advanced, demanding, or privacy-conscious users who require a full-scale product that includes everything a top-end VPN has.